From left, NS24's Joanne Turner, the chamber of commerce's Jack Clark, Edmund Johnston and John Morton and the Royal Bank of Scotland's Criona Courtney. The finalists for this year’s Scottish Borders Business Excellence Awards have been announced after five days of interviews by judges in Kelso to come up with a shortlist. 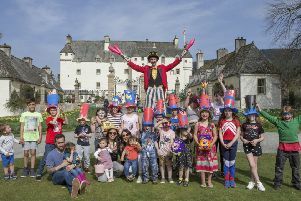 The annual event, organised by the Scottish Borders Chamber of Commerce and sponsored by the Royal Bank of Scotland, saw a 146% rise in the number of entries this year, attracting 123 in 10 categories. Chamber chairman Jack Clark said: “Once again, we have an extraordinary variety of businesses in the running for our business excellence awards. “I did not envy the judging panel their task but look forward to the announcement of the winners at our presentation lunch. The winners will be announced at a lunchtime ceremony on Thursday, November 1, to be held at Springwood Park in Kelso. They cost £48 apiece, though entrants and sponsors get in free. This year’s awards are the fourth. Those vying for the tourism and hospitality business of the year award, sponsored by Bruce Stevenson Insurance Brokers, are the Orde Food Company, Crafty Workshops, Cringletie House Hotel, Allanton Inn and Stobo Castle. Up for the title of agricultural business of the year, a category sponsored by NFU Mutual Borders, are Rule Valley Simulated Game, Velvet Hall Alpacas, Laprig Valley and Fluffy Moos. Shortlisted for the high growth or turnover award, sponsored by Davidson Chalmers, are SD Consultancy, Redpath Recycling and SoConnect. The innovation in business award, sponsored by Scottish Borders Council, will go to SoConnect, Love Scottish Candles, Findra, All Awards, ThermaFY, MB Glass or Agenor Technology. In the running to be named social enterprise of the year, an award sponsored by the Scottish Borders Social Enterprise Chamber, are Live Borders, You Can Cook, the Scottish Outdoor Education Centre and the Learning Space. The shortlist for the supporting the young workforce award, sponsored by Developing the Young Workforce Borders, is made up of Prosperity Financial Services, Border Safeguard, All Awards, Aquarius Hair Design and Johnstons of Elgin. Up for the prize for manufacturer of the year, sponsored by Reiver Recruitment, are Wonky Woolies, Love Scottish Candles, Selkirk Distillers and Jarvis Pickle. Collingwood-Norris, Johnstons of Elgin and Simpson Combustion and Energy are all in contention to be named exporter of the year, a prize sponsored the South of Scotland Local Export Partnership. The microbusiness of the year award, sponsored by NS24, will be won by Danny’s A7 Car Wash, Wonky Woolies, SD Consultancy, Collingwood-Norris or Hawick Autocare. And the accolade for best small or medium-sized enterprise, sponsored by Business Gateway Borders, will be won by SoConnect, Pearson of Duns, Agenor Technology or Hastings Legal.